The sleek styling of the Skyline Series offers stand out bench seating that sets a stylish atmosphere. The modern design of the slightly contoured perforated seat is balanced by the precision formed frame and armrests. 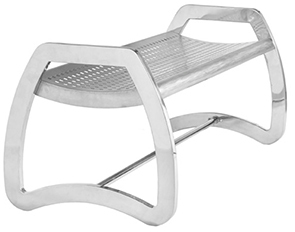 Made with durable 304 grade stainless steel materials, the Skyline Bench is ready for high volume use. Available in 4' and 6' lengths, anchor bolts included for surface mount installation.